Choose from our six unique cabins or our loft suite looking over the water, all of which afford a unique sense of charm and allure! 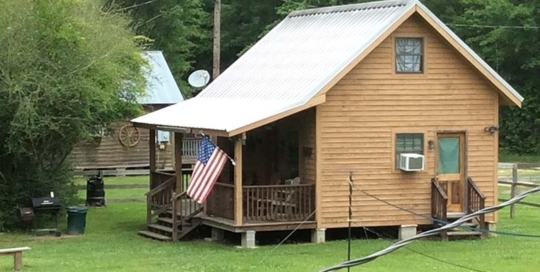 Located in beautiful Bogalusa Louisiana, our cabins provide cozy lodging that can accommodate four to twelve visitors comfortably depending on the cabin you choose. We have outfitted our cabins with modern and convenient amenities, including fully-equipped kitchens and bathrooms. We’ve also provided each cabin with relaxing porches to allow visitors the opportunity to enjoy the serenity of Louisiana’s beauty at ease. Your group can also congregate at our 2700′ party deck/pavillion, which can host up to 100 guests for any occasion. Consult the list to the left to learn more about each individual cabin; head to their pages to see what makes them so unique, and find out which one suits your Berry Creek vacationing needs! Click to contact us with any questions. The first in our western theme the "Trading Post" cabin is reminiscent of the rugged days of barter & trade and of general stores as the west was slowly won. As you cross over the 40' bridge from the party deck to our latest cabin you will be transformed to another place in time within its period decor. Trading Post sports open and covered decks, a full bathroom, living room, kitchen and dining area. The single bedroom downstairs along with the two open lofts allow for sleeping up to 10 guests between its 6 single use beds. Relax in an atmosphere that blends old time charm with modern conveniences. As an additional service Berry Creek Cabins has partnered with J&D River rentals to offer our guests a different way to vacation and enjoy our unique neck of the woods. We now have both onsite and a limited selection of portable travel Campers and one RV. Starting this year two of our four portable vacation campers will be available for use here on our main grounds or we will deliver/set up, for no additional fee, at your choice of two local campgrounds off of Hwy 16 along the Bogue Chitto river tubing/canoeing routes. You are required to reserve the camper(s) with us then separately book your dates and arrange payment with either Tony @ Bogue Chitto Campground or Van @ Riverbend Campground and we would do the rest by having your rental camper set up at your choice of these two locations turnkey ready for you. Our campers are outfitted with all of your basic needs from bed linens, full kitchen to bbq pit, chairs and outside needs. You only need to provide your own towels. Covered RV hookups for your RV or Camper on Berry Creek Cabin grounds. Rates starting at $40 per night (plus tax).